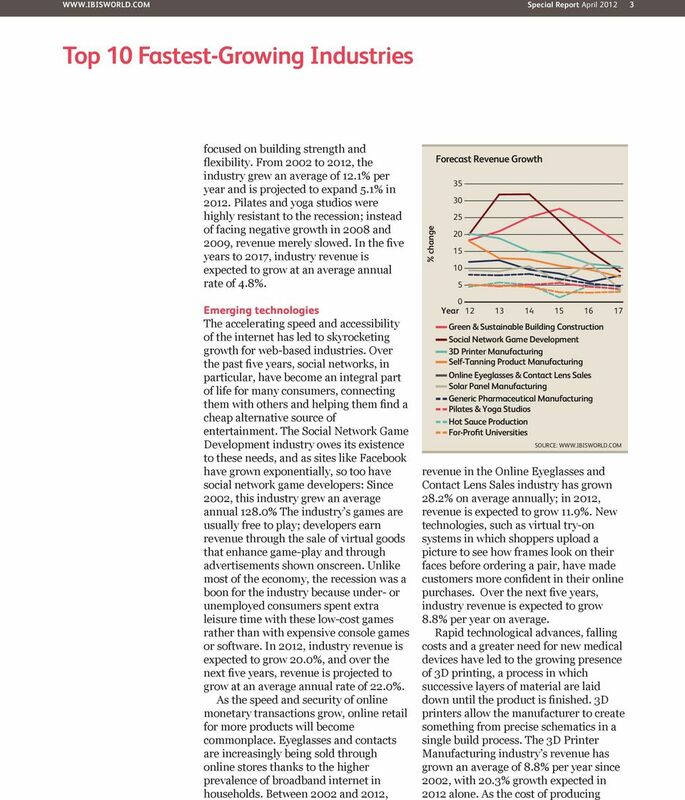 Download "Top 10 Fastest-Growing Industries"
4 Special Report April About IBISWorld Inc. Recognized as the nation s most trusted independent source of industry and market research, IBISWorld offers a comprehensive database of unique information and analysis on every US industry. With an extensive online portfolio, valued for its depth and scope, the company equips clients with the insight necessary to make better business decisions. Headquartered in Los Angeles, IBISWorld serves a range of business, professional service and government organizations through more than 10 locations worldwide. For more information, visit or call Contact: Savannah Haspel VP, Public Relations IBISWorld Phone: these high-tech machines decreases and printer technology is refined, they will be used for an increasing number of applications, such as aerospace-related part manufacturing. With the rapid pace of innovation already present in the industry, double-digit annualized growth (14.0%) is projected to continue into the next five years. Other upstarts In 2012, the For-Profit Universities industry s revenue is projected to grow 5.0%, and over the next five years, revenue will grow an estimated 3.6% per year on average. As more and more high school students seek a college education after graduating, gaining admission to traditional public and private universities has become more difficult. At the same time, state budget cuts have shortened the resources these institutions can use to cope with the influx of students. Stepping in to alleviate the heightened demand for higher education, for-profit universities have become a common sight in education in the United States; since 2002, the For-Profit Universities industry grew an average of 13.6% annually. Classes taught at for-profit universities are often accessed through alternative means to the classroom, such as through TV programming or the internet. The low cost of teaching online classes has been particularly essential to the rapid growth of these institutions. Moreover, with the high unemployment caused by the recession, workers and high school graduates without a job chose to continue their education rather than combing the job market. Independent of state budgets and able to avoid the high tuition costs of private schools, for-profit schools grow by selling shares to investors. The Generic Pharmaceutical Manufacturing industry has found sustained growth over the past 10 years, with average annual revenue growth of 9.6%. As the median age of the US population increases, more consumers require a greater amount of prescription drugs. Generic drugs are sold without patent protection and tend to be cheaper than brand-name drugs, making them more attractive in the face of rising overall healthcare costs. Many industry operators have closed inefficient plants and removed redundant sales positions to cut costs, expanding profit margins. However, as more consumers qualify for private insurance, insurance providers will gain more leverage to negotiate lower drug prices, which could reduce the industry s profit margins. Still, revenue is expected to continue rising, with 8.1% growth expected in 2012 and average annual growth of 6.3% projected through The Hot Sauce Production industry has heated up over the past 10 years, with average revenue growth of 9.3% per year and expected 2012 growth of 4.5%. While the recession did cool the industry s prospects, rebounds in 2010 and 2011 reestablished it as a rapidly growing part of the food sector. Demand for hot sauce has been driven by demographic consumption trends, immigration and international demand from Canada, the United Kingdom and Japan. As Americans palates have become more diverse, hot sauce has earned tenure on the dinner table. Demand from supermarkets and grocery stores has reflected the change in consumer taste, and food retailers are dedicating more shelf space to ethnic cuisine. Ethnic supermarkets also growing rapidly more prominently offer a variety of hot sauces than more traditional stores. Hot sauce production isn t expected to burn out any time soon: Over the next five years, industry revenue is projected to grow at an average annual rate of 4.1%. 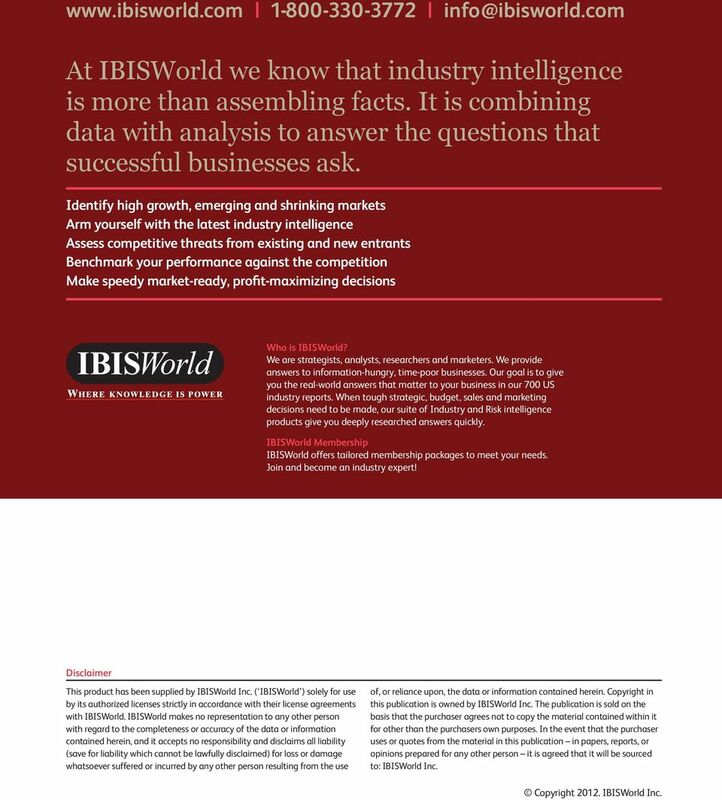 5 At IBISWorld we know that industry intelligence is more than assembling facts. It is combining data with analysis to answer the questions that successful businesses ask. Key External Drivers continued Identify high growth, emerging and shrinking markets Arm yourself with the latest industry intelligence Assess competitive threats from existing and new entrants Benchmark your performance against the competition Make speedy market-ready, profit-maximizing decisions Who is IBISWorld? We are strategists, analysts, researchers and marketers. We provide answers to information-hungry, time-poor businesses. 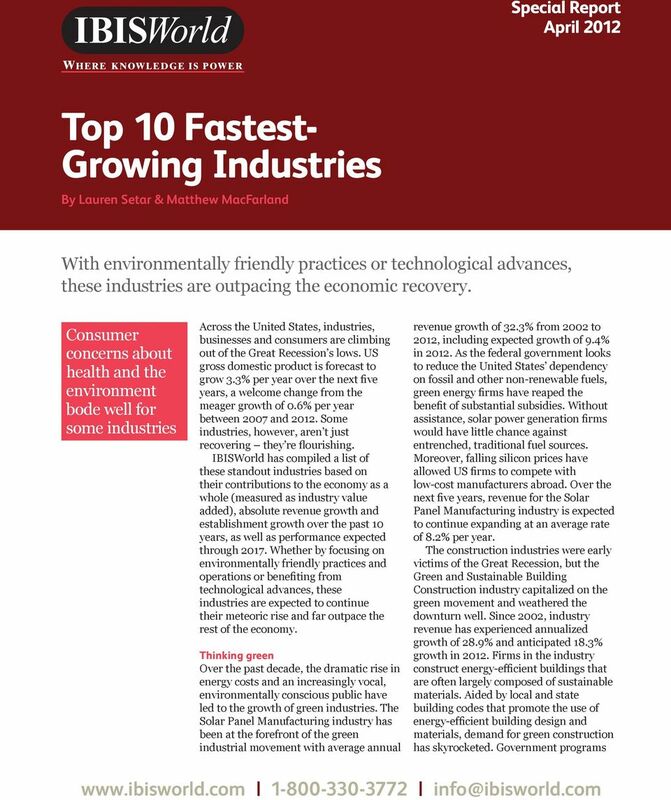 Our goal is to give you the real-world answers that matter to your business in our 700 US industry reports. When tough strategic, budget, sales and marketing decisions need to be made, our suite of Industry and Risk intelligence products give you deeply researched answers quickly. IBISWorld Membership IBISWorld offers tailored membership packages to meet your needs. Join and become an industry expert! Disclaimer This product has been supplied by IBISWorld Inc. ( IBISWorld ) solely for use by its authorized licenses strictly in accordance with their license agreements with IBISWorld. IBISWorld makes no representation to any other person with regard to the completeness or accuracy of the data or information contained herein, and it accepts no responsibility and disclaims all liability (save for liability which cannot be lawfully disclaimed) for loss or damage whatsoever suffered or incurred by any other person resulting from the use of, or reliance upon, the data or information contained herein. Copyright in this publication is owned by IBISWorld Inc. The publication is sold on the basis that the purchaser agrees not to copy the material contained within it for other than the purchasers own purposes. In the event that the purchaser uses or quotes from the material in this publication in papers, reports, or opinions prepared for any other person it is agreed that it will be sourced to: IBISWorld Inc. Copyright IBISWorld Inc.
PRICEMETRIX INSIGHTS SPECIAL EDITION, FEBRUARY 2013 Introduction In this edition of Insights, we examine multi-year results for key performance metrics in the North American retail wealth management industry.